Parts baskets are a trouble-free method of placing smaller items on the parts washer turntable for cleaning. Basket is easy to anchor to the turntable with a ratchet strap thread through the lifting eyes. 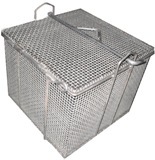 Various baskets sizes are available as well as various materials and finishes such as stainless steel or PVC coatings.